Maharaj Charan Singh, the author of this book, was the fourth Mater in the Beas line of spiritual Masters in Punjab, India .He travelled extensively throughout his life to carry the universal message of the saints to every corner of the world. During three forty years of his ministry, he initiated many thousands of souls into the way of the Word, the science of the soul. 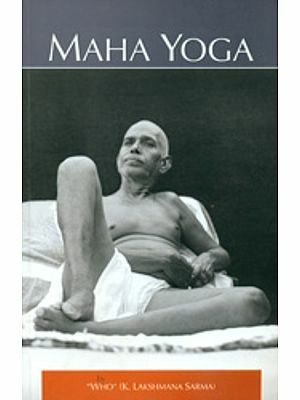 This book comprises excerpts from letters written by him in response to the questions and problems of his disciples. Saints come into the world with the sole purpose of liberation suffering humanity. Unlike the majority of humankind, they are free, self,-realized beings, untrammeled by the entanglements which tie everyone else to the creation. Though appearing as normal human beings, they are the embodiment of the divine creative power, the dynamic aspect of the supreme reality which is known in different cultures and religions by many different names. In the Bible this power is referred to as the Word or the logos, and it is called by Indian saints Nam and Shabd. The Word reverberates within every living being, but we cannot realize it without the grace and guidance of a living Master. Being one with the Word, the saints alone hold the key which enable a person to unlock this great treasure lying within, and they reveal to their disciples a specific and scientific method whereby it can be realize. One a disciple hears its entrancing melody within and experiences its sweetness for himself, the pleasure of the world lose their charm and become dull and insipid by comparison. When he listens to its sound, he hears in it the loving call of God, a call that emanates in grandeur and glory from the source of al. Following this inner sound the disciple is able to rise above all the entanglements of the world and retrace his journey to his true original home. Saints offer their light to one and all, irrespective of the differences of culture, society and religion. When they give out their teachings, whether in the form of personal guidance, large gatherings, or in letters, they speak form that deep pool of which has always guided spiritual seekers and sustained them in their endeavor to realize themselves and God. Describe that Friend who has no peer. He served the sangat tirelessly from 1951 to 1990, guiding all with his great love and wisdom. 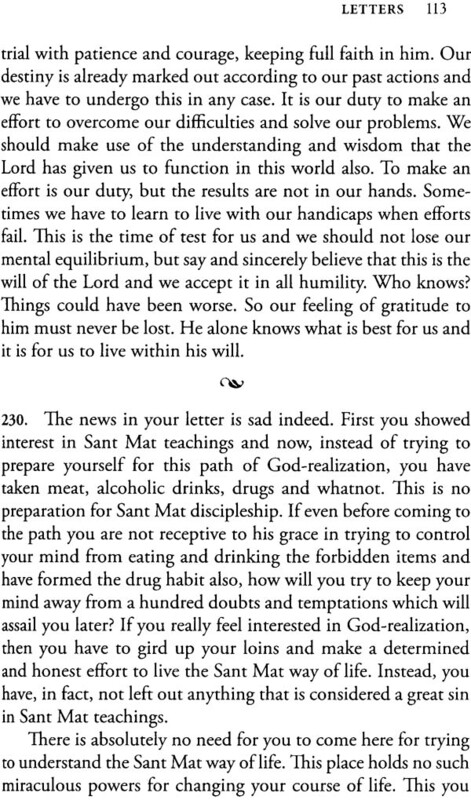 Through these letters written between 1965 and 1971, he explains the perennial teachings of the saints in simple, modern terms, and offers practical guidance on a whole range of problems faced but today’s disciple trying to fulfill their worldly responsibilities while keeping their spiritual objective to the fore. INDIA HAS PRODUCED many advanced souls through whom thousands in the East have achieved spiritual freedom. 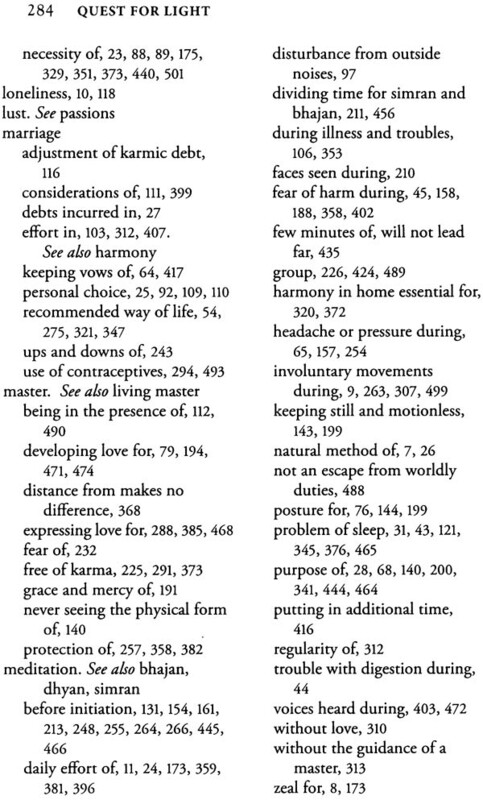 The message and the method of these great Masters have been recently introduced to the West and increasing numbers of people have felt the appeal of their unique message. These Masters are not new to history as there have always been enlightened souls who have been the spiritual life-blood of the human race. A few of these, like Buddha, Muhammad and Christ, have been well known, but many others equally advanced have walked the earth unheralded and almost unknown. It has been a habit of the West to think that these great souls were a part of the past, but the Sant Mat philosophy that is the basis of this volume declares that these illuminated souls have always been among us and are among us even today. 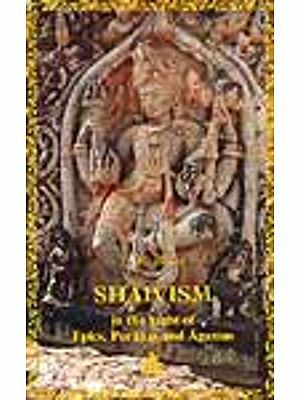 To several hundred thousand people from every corner of the globe, the author of this book, Hazur Maharaj Charan Singh Ji,* is one of this great line of mystic guides or spiritual Masters who come from God and are sent to show mankind the way back to the supreme Father's mansion, our original home. In the West there is at present a surge of interest in these unique souls and their teachings, which testifies to the spiritual hunger that exists in modern society. Modern man is seeking answers to problems which disturb him and rob him of his peace of mind. 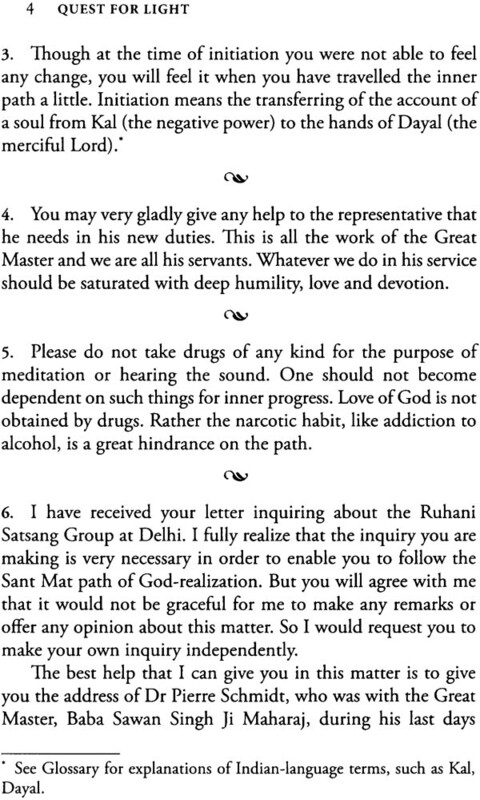 This widespread condition has arrived at a time Maharaj Charan Singh passed away on June 1, 1990. Two days before departing, he appointed Sardar Gurinder Singh as his successor. when the old established religions and faiths have grown uncertain and fail to meet the need. These searching souls intuitively feel that there must be an answer to this vacuum, to this evident emptiness which is so keenly felt in our times. 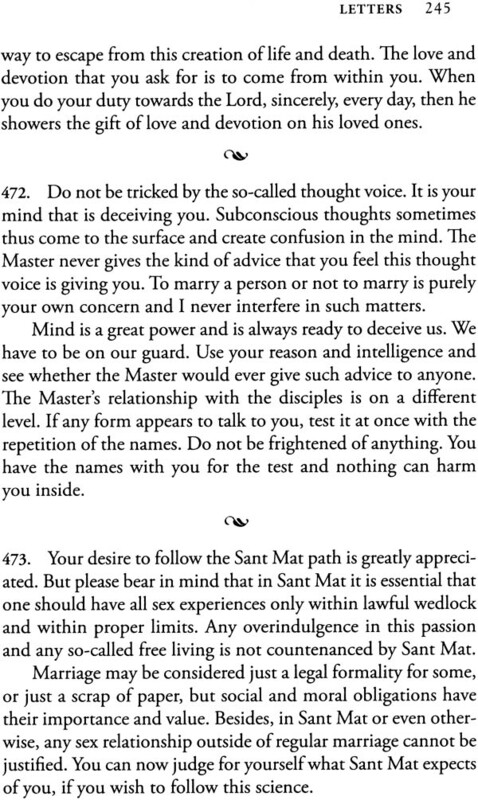 The teachings of the saints (Sant Mat) offer a practical spiritual answer, not just based on theory, but on a tested system as old as history, though to each age a new discovery. It is the very method provided by the supreme Father for man's release from all that imprisons him and ties him to the wheel of birth and death and which binds him to a role of continuous struggle and suffering. It is an answer which offers him, through a time-tested method, the opportunity to be free and enter the realms of light and life which are the source of all life. 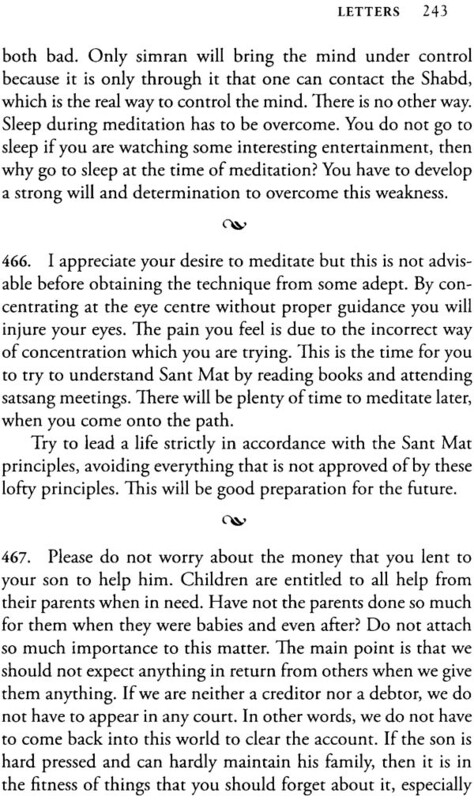 Sant Mat is the answer to man's despair. For many of the West who have come to the conclusion that life has no purpose, that life is nothing but a meaningless struggle, these spiritual teachers come with their message of hope. It breathes into the human struggle or suffering a sense of cosmic purpose and direction. Sant Mat teaches that this world is a vast schoolroom for souls and this schoolroom is under the close direction of the Lord of Life. It further states that into the world, the supreme Father sends his Sons to prepare and lead to freedom the souls who are ready to make the ascent into the upper, inner regions of light. All religions have spoken of some kind of heaven, whether the heaven of Christendom or the Nirvanic state of Buddhism. 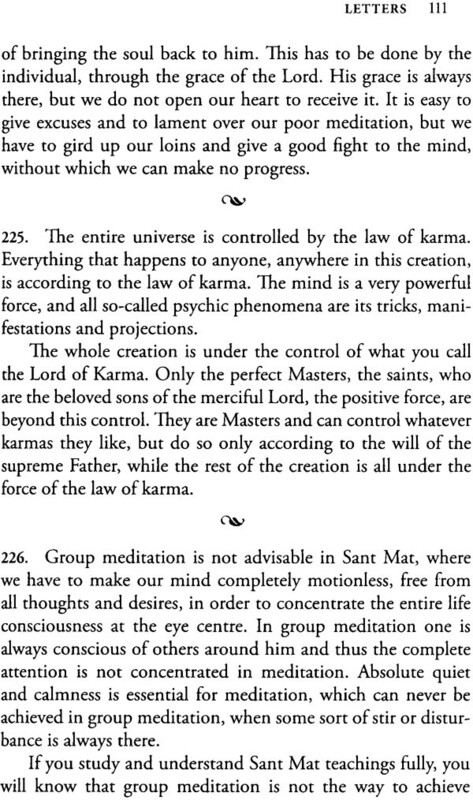 Sant Mat, however, more closely defines this inner cosmology and presents a definite system and method for liberation from the prison house of earthly life into the state of God-realization which is true spiritual emancipation. Again it should be stated that to the saints or illuminates who come, this is not just theory but experience which they themselves have gone through, a path which they themselves have travelled. They point out the exact method which they used, a method which basically does not vary from age to age. They describe the ascent into the upper regions and reaches of life, again from their own observations. 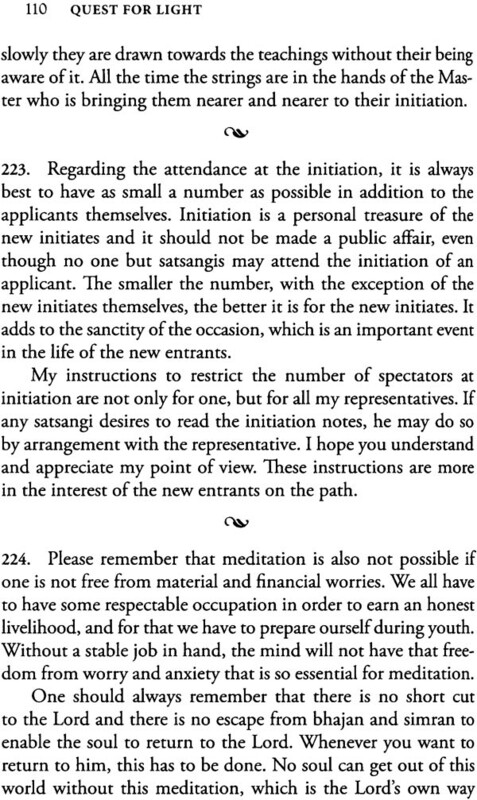 These observations also do not vary, be they from a saint of the distant past or a modern saint who walks the earth today. 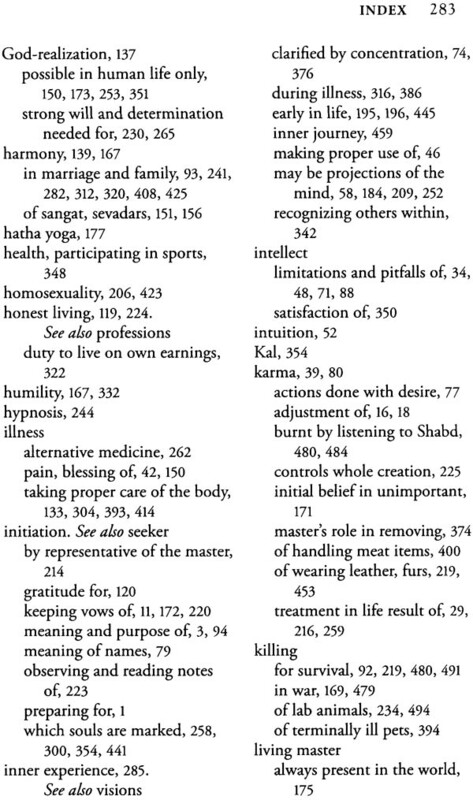 One universal declaration of all these saints is the need for a living teacher or Master. They point out that all advanced teaching, whether that of mathematics, science or philosophy, needs a living teacher for the best means of learning. This science of soul-liberation or God-realization, being the most difficult and complicated of all sciences, especially needs the living teacher to unfold it to the student to enable him to make the best progress. The saints have often been referred to as guides who have made the journey to this distant land of promise and have now returned to take other voyagers to those longed-for regions of beauty and light. The author of this book has often used the illustration of a stranger coming into a city asking for the house of a friend. When he contacts a guide who knows the city, he soon is at the door of the friend. These illuminates carry the mark of their true greatness in the very humility which characterizes them. From the abundance of the heart of God they have come, exacting nothing for their own material gain from those who are drawn to their teachings, but giving the rich treasure of life, truth and inner knowledge to all who long for spiritual freedom. These liberators of humanity come on their mission of mercy to the world with no other object than to minister to all through a love which is so uplifting to man's confused and fallen state, so healing to the hurts of the world, that it is the -very image of the love of God. The illuminate, as the term implies, has contacted the universal source of knowledge and thereby become to his time a fountainhead of shining wisdom. 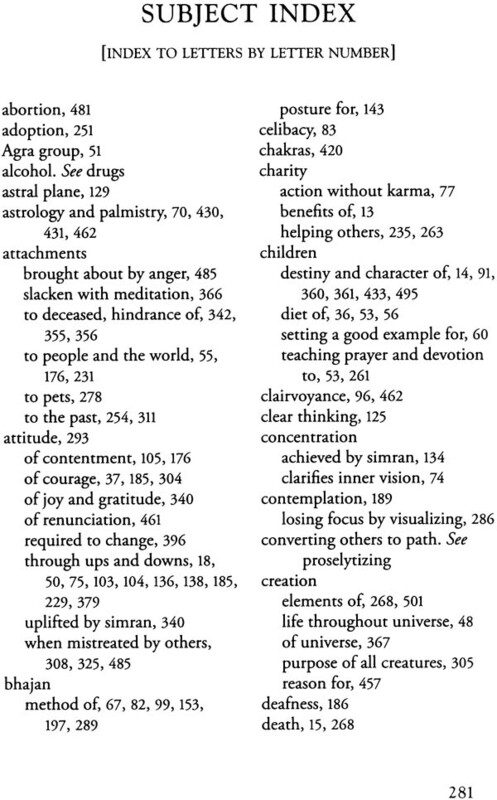 This book is the attestation of such wisdom, for these excerpts from letters written to seekers and disciples from all over the world share profound insights and answers to all manner of problems to which humanity is prey. 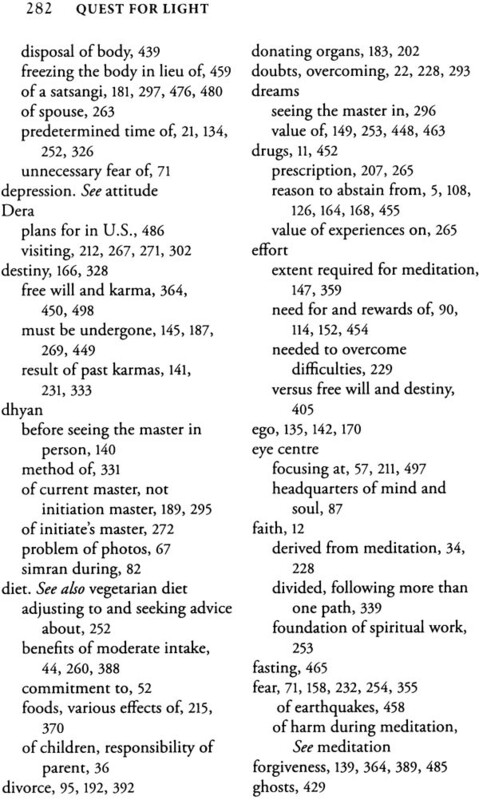 The answers are presented simply but with a unique profundity which always characterizes the wisdom of the true Master. Another fundamental truth contained in this philosophy is the inward nature of this liberation. No one will ever become free by searching in the outer world. The path to life is within, and the journey is inward. Christ said "the kingdom of heaven is within you. "2 All saints emphasize this basic truth. The regions which the saints traverse are all within the consciousness of the human being and the saints hold the key to the inner door and are guides on this journey. The illuminates or saints emphasize that God has provided each person with the potential to open this inner door in order to start this journey. The key is a method by which contact is made with divine light and sound called the Word, Shabd, or Nam, without which no journey to spiritual heights is possible. It is by following this inner sound and light that the disciple returns to his original home. The Masters place the lost soul in contact with this guiding light and sound. The gift they bestow is not received through reading books or listening to lectures. It must be had from an illuminate of one's time who can demonstrate the method and bestow that grace which enables a devotee to follow the inner path. 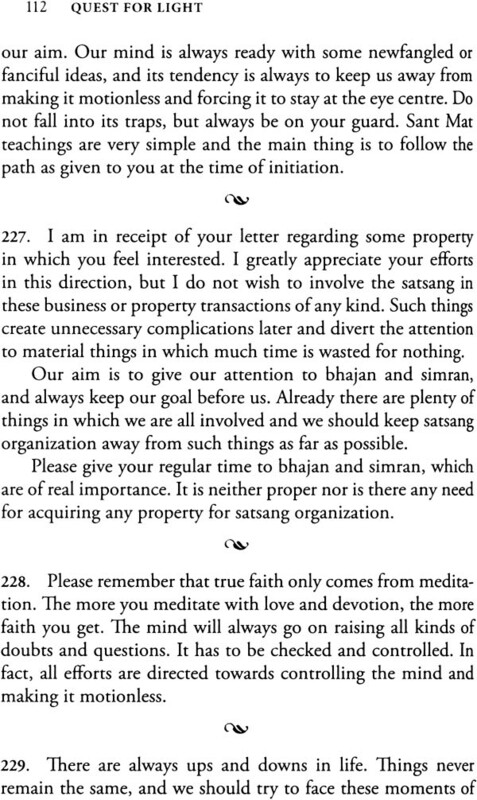 Sant Mat is called a spiritual science because it presents a definite method which can be practiced. It is a mystic philosophy because it affirms the possibility and practicability of the individual's return to his original home in the heart of God. 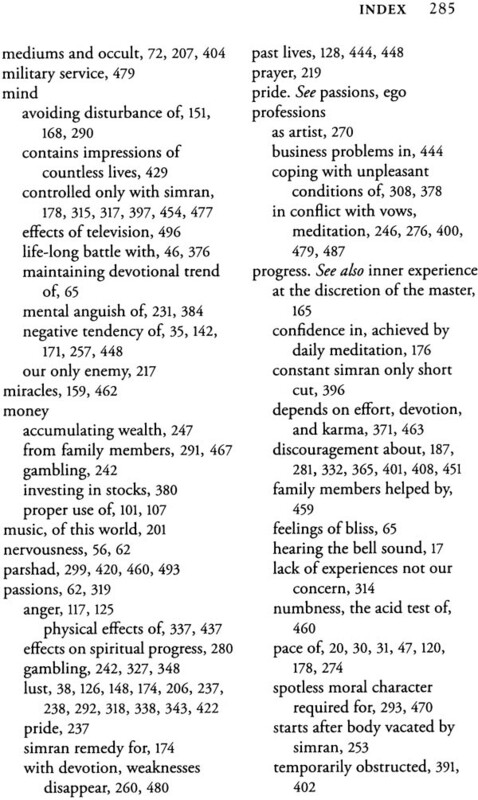 Sant Mat is a radiant answer to humanity's present confusion because it explains in simple terms the reason for human suffering. It presents a world view that clarifies the purpose of life on earth. To unfold this, the saint is born into the stream of time to shed rays of light into the darkness and to bring to everyone the promise and privilege of walking the road to inner freedom. 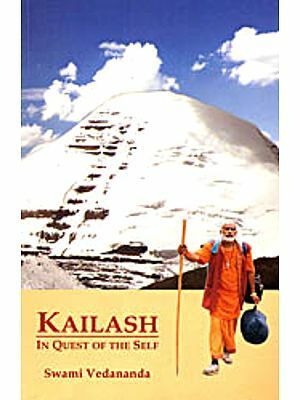 The author has written five previous books, which have lifted and expanded the spiritual horizons of thousands of seekers and disciples. We are confident that this volume will likewise be received with enthusiasm and will meet a very real need in the world today. THE AGE-OLD QUEST FOR LIGHT actually started with the Creation. The hunger to know something about our self and our Creator was inborn in humans. The presence of so many religions and theologies in all countries and in all ages is clear and conclusive evidence of that eternal search for light and knowledge. Humans have never been satisfied with life on earth, but their quest in recent times seems not only to have intensely increased in the West, but also to have taken a new turn. People today find it difficult to swallow the dogmas and doctrines offered by the old traditional religions. Their intellect revolts against beliefs and dogmas that do not stand the scrutiny of reason and sound common sense. They are not irreligious and do not deny the existence of God. But they are sincere and critical seekers after truth, the whole truth and nothing but the truth. They want to know the real, absolute and unadulterated truth, not only about what they see with their physical eyes in this world, but also about the unseen world. Problems such as the following baffled Socrates and Plato, Aristotle and Pythagoras: Who and what am I? From where have I come and where will I go? Is there a purpose to human life or are human beings only freaks of nature? If there is a purpose in creating us, what is that purpose? Is this life the be-all and end-all, or is there a life after death? Can we peep beyond this dark veil of death? These same problems still agitate the minds of people today. 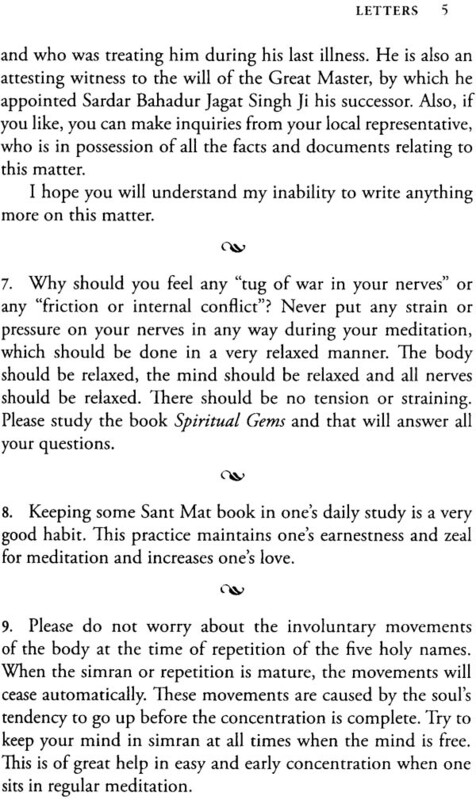 In their tireless search for satisfactory answers to these questions, some of them happened to come in contact with Sant Mat. This ancient path of the Masters—a scientific method of entering and realizing the kingdom of heaven in the human form while still living—seemed to supply convincing answers to their scientific minds, with the result that increasingly large numbers are being drawn to it. The letters that form the subject matter of this book were written in answer to queries from people in the West with a background in the Christian faith. A careful study of the Bible will reveal that the teachings of Lord Jesus Christ were the same as have been the teachings of all true saints, to whatever country or clime, religion or time they belonged. Truth is one and eternal. The same truth is enunciated by all the Sons of God who come to this world from time to time to revive the same ancient teachings. In the course of time, these teachings again become obscured and eclipsed by the blinding smoke of rites, rituals, ceremonies and formalizations. Saints never found or establish any new religion, creed or sect, or bring any fresh revelation from the Lord. They come only to show to suffering humanity the same ancient way back to their eternal home of everlasting peace and bliss. This way, with which Christ identified himself by saying "I am the way", is not subject to any change and is the same for all times to come. This law is eternal. It is the same for yesterday, today and forever. It is the same way through which the soul originally descended to earth from its home in heaven. It is God's own design, and no addition, alteration or modification can be made or suggested in it by any man or prophet. In the beginning was the Word, and the Word was with God, and the Word was God. The same was in the beginning with God. All things were made by him; and without him was not anything made that was made. In him was life; and the life was the light of men. Christians of later periods failed to appraise the value of the pearls of great price, the spiritual gems, that lay hidden in the Bible, because the traditional literal interpretation of its words did not convey the real sense in which these were used by their author. The teachings of Jesus had a deep spiritual truth concealed in them and could be understood only by those who were initiated into the knowledge of the esoteric terms and the mystic practices at the time. 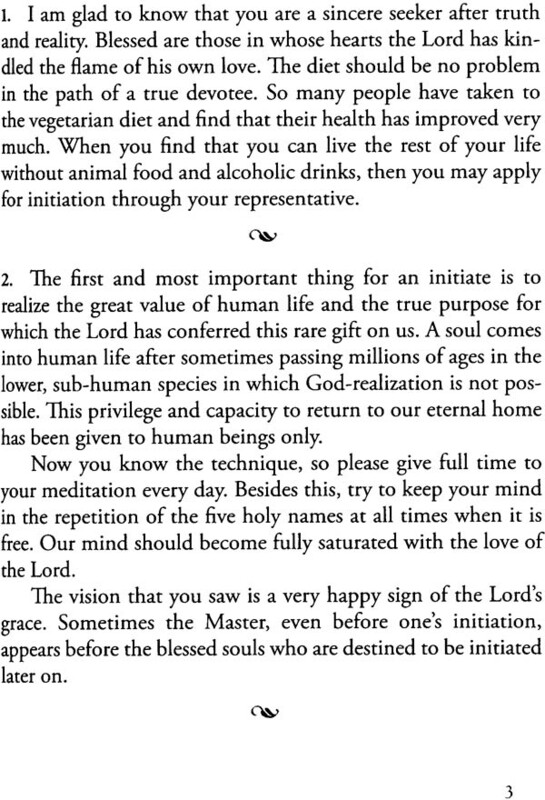 To any ordinary initiate of a Perfect Master the words of Lord Jesus Christ would give a different message. The Bible is to be interpreted esoterically. Most of its messages were meant for the initiates of Jesus only, so words and images intelligible only to them were used. This is why the best annotators of this great book have failed to understand the meaning of such a simple term as 'Word'. Frequently they have taken it in its dictionary meaning and have held that it means the words of Jesus or of the Bible, rather than its mystic meaning as the power of God, the eternal Word that creates, purifies and redeems. The Bible is full of the sins of translation. A translator should not only know intimately and precisely the languages, but should also be well versed in the terminology and nomenclature of the subject which he has taken upon himself to translate. Unfortunately, ignorance of the language and the subject matter of this great book have rendered the greater part of it unintelligible to the modern seeker. Recent research has abundantly proved that there existed in those days mystic schools and societies of the Wisdom of Logos, which later on Maulana Rum and others in Persia, and Kabir, Nanak, Dadu, Soami Ji and other saints in India, offered to their followers. All these saints taught their disciples how to listen to the inner voice of God, the living Word, the Logos, the audible life stream, that issues forth from the Lord's mansion and, passing through all the regions, reverberates constantly in our forehead in the form of a sweet celestial music. Saints say that God dwells within this temple of nine gates— the human body. Christ expressed the same truth when he said the body is "the temple of the living God" and "the kingdom of God is within you". This heavenly harmony, the celestial strain that is being struck in our forehead, is the cord that connects our soul with the holy feet of the Lord, "a ladder set up on the earth, and the top of it reached to heaven: and behold the angels of God ascending and descending on it. And, behold, the Lord stood above it, and said, 'I am the Lord God...'." I came not to send peace, but a sword. For I am come to set a man at variance against his father, and the daughter against her mother, and the daughter in law against her mother in law. Guru Nanak says, "The Guru cuts the chains and bonds of his disciples." Saints always advise us that unless we break the chains of our attachments and withdraw our attention from the world and its pleasures, we do not merge back into our Source. So long as this is not achieved, there can be no hope of our ever enjoying true peace and bliss. The Lord, by meeting whom our soul will escape the ever recurring agony of birth and death, cannot be seen anywhere outside, but dwells within our body. The kingdom of God is within us, for we are "the temple of the living God". How can we enter this temple and meet the living God there? For this purpose we need a living Master who can show us the way to enter this temple and put us on the path of the Word or Logos which "was with God, and was God" and whence the world emanated. The Word is also called the Name, Nam, the Truth, Shabd or the divine Sound. The Bible also refers to it as the Holy Ghost, Holy Spirit, the Comforter and the living water. Because it manifests itself in the human body in the form of sound, it is called the audible life stream and the sound current. This inner unstruck music is so sweet and captivating that our soul is automatically attracted and pulled by it towards higher regions, which are referred to by Christ as "in my Father's house are many mansions”. As the mind begins to enjoy the enchanting taste of this Word, its sweetness and magnetic pull detaches the mind completely from all the ephemeral pleasures with which it was attached before. If ye continue in my word, then are ye my disciples indeed; And ye shall know the truth, and the truth snail make you free. Now you are clean through the word which I have spoken unto you. And again Christ says, "God is a Spirit: and they that worship him must worship him in spirit and in truth." Guru Nanak also uses 'Word' and 'Truth' as synonymous terms. All the Perfect Masters initiate their disciples with this Name or Word, or as the Bible puts it, "baptizeth with the Holy Ghost." 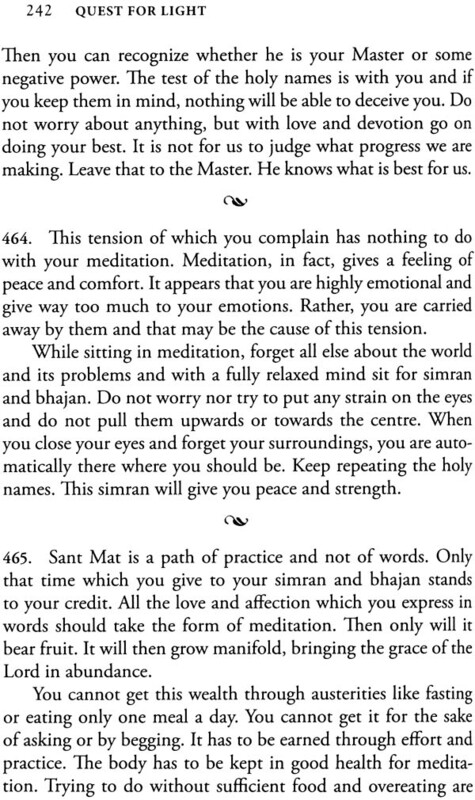 Soami Ji says, "The Master who does not know the path of the Word is no Master at all." Perfect Masters tell us how to open the third eye and to hear the celestial symphony there. When our attention becomes concentrated and one-pointed at the eye focus, we discover for ourselves that there is a sweet melody which emanates from the mansion of the Lord. This is the "ladder" on which we rise back to our home. Practise that system of yoga by which you experience death while living. In this body are many treasures. But one sees them only when one meets the Master. Those who see the light of the inner flame and hear the Word become attached to the true Lord. I am come into the world, that they which see not might see; and that they which see might be made blind. The meaning is quite clear that those who do not see God, but see only the objects of the world, may be made blind to the world and its objects and may be given sight insofar as God is concerned. I am the light of the world: he that followeth me shall not walk in darkness, but shall have the light of life. He that seeth me seeth him that sent me. Believe me that I am in the Father, and the Father is in me. "The Lord's devotee is like the Lord; make no difference because of the human form": unless the Lord takes the human form and comes to our level in the form of a Master, he cannot make a meaningful contact with us. God manifests himself in the Master and speaks only through him. Maulana Rum says: The Great Lord locked himself behind a tightly fastened door; he then put on the garb of man to open the door himself. Christ also calls the saints "the Word made flesh". When the Word takes the form of a man, that man becomes a living Master. The man in whom the Word of God dwells is made like God—nay, becomes God himself. God and the Word and the living Master then are one and the same. The spirit of divinity lives in the body. Recognize Him in that body, O Namdev, for devotion to Him alone is of any worth. As Christ says, "Believe me that I am in the Father, and the Father is in me." Soami Ji also states the same basic truth: "The Lord God has descended to the earth, taking the form of a man" and "The Guru shows within the body the heavenly home of the soul ". These things have I spoken unto you, being yet present with you. But the Comforter [the Radiant Form of the Master], which is the Holy Ghost, whom the Father will send in my name, he. shall teach you all things, and bring all things to your remembrance, whatsoever I have said unto you. Blessed are they that hear the word of God, and keep it. He that heareth my word...hath everlasting life,’ and shall not come into condemnation; but is passed from death unto life. I give unto them eternal life; and they shall never perish, neither shall any man pluck them out of my hand. He alone is our friend: he goes with us to the other world, and at the time of reckoning he stands by us as our surety. I have tested and am thoroughly convinced of the truth that nothing equals the greatness of Nam and devotion. The human body is a priceless gift bestowed on man through the Lords grace. The purpose of God in conferring this rare gift is to afford to us an opportunity to return to our true home. We get this body after passing through millions of lives in the lower species, in which God-realization is not possible. In false methods is the world entangled, and no one tries to know the secret of Nam. To say nothing of the practice of the true method, people do not even know the meaning of the term 'Shabd' or 'Word'. Whosoever speaketh against the Holy Ghost [the Word], it shall not be forgiven him, neither in this world, neither in the world to come. Again, Guru Nanak says, "Those who hear the Word know their real self and are emancipated." 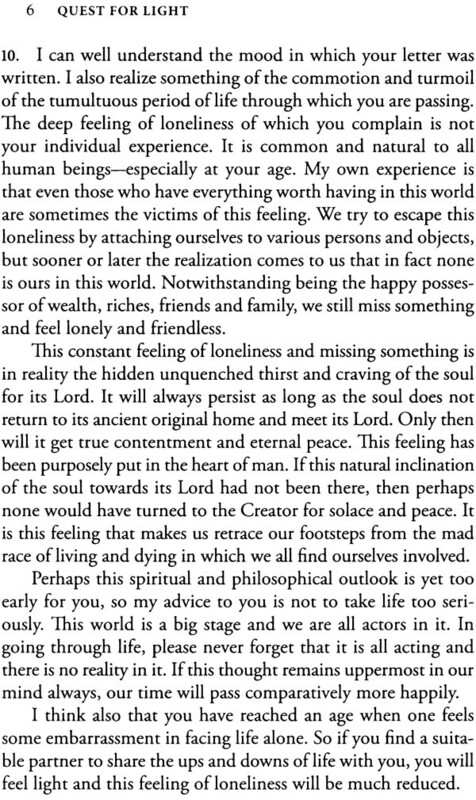 And "Self-realization comes only through the delight of the Word." This delight of the Word can be had only through the grace of a Perfect Master. This is the eternal law of God. Whenever He reveals himself to anybody, He showers this grace through a saint. The law of karma could not be expressed in more beautiful or inimitable terms than those of the Bible: For whatsoever a man soweth, that shall he also reap. No man can come unto me, except it were given unto him of my Father. No man can come to me, except the Father which hath sent me draw him. Further on Christ says, "I pray not for the world, but for them which thou hast given me; for they are thine." He also says to his disciples, "Ye have not chosen me, but I have chosen you." And again, "A man can receive nothing, except it be given him from heaven." To sum up, the message of the saints of all times is that there is one God, and our soul is of his essence. We can escape the pain and suffering of life and death only when we merge back in the Lord. The Lord can be found in the temple of the human body. It is only when we are in the human form that we can realize him. The only obstacle that lies between us and the Lord is our mind. This obstacle can be removed solely by connecting the mind with the divine melody within, which can be done only through a Perfect Master. And one meets a Perfect Master when the Lord showers his grace on us. These teachings are the same as are enunciated in the Bible by Jesus Christ, who says, with the saints, "My doctrine is not mine, but his that sent me." We speak that we do know, and testify that we have seen. Blessed are those whom the Lord chooses for his grace!